If you have an ileostomy you will most likely be using a drainable pouch which will need emptying numerous times a day. Whilst in the beginning, this might feel like a daunting and challenging task, it soon before second nature and routine. Typically, an ileostomate would empty their stoma bag between 6-7 times a day; but this is dependent on the consistency of the output, Most SCNs would like ileostomates to have a consistency like porridge but for some, this isn’t always achievable. This is the typical set up if you are at home, in a familiar and comfortable enviroment. Sit either forwards and backwards on the toilet; as far back or forwards are you can, with legs spread wide. Drop a couple of sheets of toilet paper into the bowl, to avoid splashing yourself or your clothes. Simply undo the bottom of your drainable pouch over the toilet bowl and let gravity do most of the work. Usually the pouch will empty by itself without help. If you do need help with getting the output from the pouch; simply encourage the contents by pushing it down toward the opening; withy your hands in a squeezing motion. Do this carefully to avoid splash back! It is important here to make sure that there isn’t too much output stuck at the top of the bag around the seal and / or filter. Simply hold the top of the bag and squeeze anything further down into the pouch. This only really happens in thick output situations and shouldn’t be too common place. Most important is cleaning the opening of the drainable pouch. Use a couple of sheets of toilet roll and wipe the end, then use a couple more to get inside the opening to get rid of any remaining output; this being left behind can make the ending difficult to close. Check the back of the opening of your pouch to see if any output has been left behind. Also check the clasps that help keep your bag shut – usually velcro – aren’t soiled either! They usually wipe clean with some toilet roll. Ensure you close your pouch fully so that you are secure and ready to return to your activities! Flush the toilet – at least once, as some output can be difficult to shift as well as the excess of toilet roll. Liquid output – This can be a challenge to empty because there is a lack of control when it comes to how fast it comes out of the bag. If you can feel your bag is far more liquid than usual, some good preparation goes along way – throwing in more toilet roll to the bowl to avoid more probable splash back, making sure you’ve got some control of where your bag is aimed towards is also helpful. If liquid output is becoming more frequent; it might be an idea to use a gelling sachet to your bag after emptying. There are a few options – ConvaTec Diamonds, CliniMed Morform and Trio Pearls. And if liquid output persists for more than a day or two, whilst you hydrate; it would be advisable to seek some medical attention. Thick output – Whilst not as a challenge as liquid, it still provides some difficulty; as it becomes very hard to actually empty your pouch. When your output is like this, you will definitely have to squeeze the output from the bag, which is messy in some instances. If this is a normal consistency for you but it leaves you feeling frustrating, lubrication products might be of some help. Stances – Some prefer to kneel or even stand to empty their bag, where as some just sit facing the back of the system, and some prefer siting as if they were peeing. Either way, you will find what works best for you. There is no right or wrong way to empty your bag. At the end of the day, as long as its emptied, that’s the result you’ll want. Public bathrooms – This can be a tricky one. Try and find a larger, more accessible toilet, so that you have the space you need. I always wipe the seat down – you just never know what you might sit in. If you face the toilet and its an automatic flush, be aware of where this motion detector is – it’ll give you a fright when it flushes and weren’t expecting it, as well as probably splashing you unexpectedly! I try to get more toilet roll going before I open the pouch, so I’m not fumbling around for more when I need it. I also flush twice and spray my travel ostomy deodorant too; not just for everyone else, but me too – public bathrooms aren’t the most pleasantly smelling of places. I always always always double wash my hands and make sure they are dry before leaving. Some people like to use lubricating deodorant in their bags when they’ve emptied their pouches so that it help aid the output falling to the bottom of the pouch as well as smelling fresh too. Example products would be Coloplast Brava Lubricant Deodorant and Hollister Adapt Lubricating Deodorant. Some also like to use sprays and drops so that the smell of the output doesn’t linger. Example products would be CliniMed Limone Ostomy spray and Respond OstoMist Odour Neutralising Drops. Some people like to wash out the pouch so that there is no reminisces of output in the bottom half of the pouch. Please be mindful in doing this, as water can break down the seal of your bag and possibly cause potential leakages. SCNs don’t recommend this at all, due to this reason, but its a personal choice. If you empty your bag and it is more that 1/2 full you risk the pouch pulling away from your skin, causing not only irritation, but also leaks, odour and soreness. When squeezing the contents of the pouch down into the toilet, you will naturally be able to feel your stoma in the bag. Pushing the output down the pouch past your stoma, won’t hurt or harm it in any way; so please don’t frightened or alarmed if you do actually touch it in there. However, if it does hurt; it would be wise to seek some advice from your SCN. It will take you a few times to get this right and that is normal. Sometimes you’ll end up missing abit of soilage from your bag or you’ll get abit of splash back, it happens. Emptying in new environments is a challenge! Trains, coaches and airplanes spring to mind! Due to the confined space, its hard to always do your usual routine, so please be flexible and don’t panic! Take some calming breathes and just empty as you normally would. You have do it, otherwise your bag will explode and that’ll be worse to deal with; trust me! When I first had my ostomy, I was so perplexed by how many different ways there were to empty my bag. I tried all of them during my post op recovery, and whilst I did settle on doing it facing the system, I’ve now gone back to just sitting as if I was just using the toilet anyway. Flaws in that is that 1. I sometimes forget to pee whilst I’m there too, and vice versa! 2. If I’ve put my bag on and its angled in the wrong way – ie, it points more towards my other thigh, instead of in between my legs – I have to take consideration to aim my opening into the bowl. Whilst I’ve found that emptying my bag to be routine now, emptying it in a new or unfamiliar place still abit daunting. sometimes it is a challenge. I remember emptying it for the first time on a train – high-speed from Peterborough to London – and boy that was interesting! You don’t realise how fast and bumpy trains can be! I can’t say I’ve emptied on a coach or an airplane yet. I find that on longer journeys I will use a gelling agent to help my output be abit more solid for when and if I need to empty it. 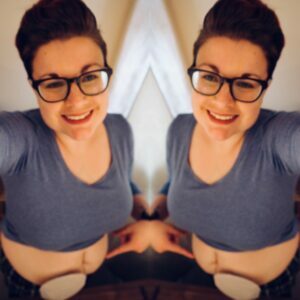 But overall, I’ve learnt to just trust myself when it comes to my ostomy. It will do what it needs to function and I have to respond. If it needs emptying, I gotta do it. I can’t just ignore it – I have done and this lead to a messy and exhausting night, of which I don’t want to repeat again. What is important to remember is that this will become routine and easier to do, like everything else with your stoma becomes. It is the simplest thing but yet it can feel the most daunting because its new and it means you are different. But hey, so what? What makes you different is something amazing and life saving, as well as life affirming. Plus, toilet trips to empty your stoma bag take a quarter of the time they used to when I had my colon in! Small victories eh? How do you empty your stoma bag? Do you have any different tips or hints that could help new ostomates?